ALL EYES ON I-66! - UPHOLD ENVIRONMENTAL STANDARDS! Another big project brings big changes to the Accotink Creek watershed, none of them likely to be good. 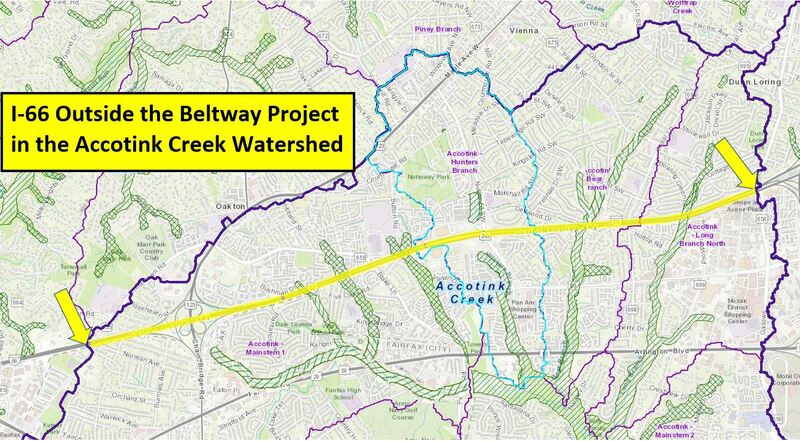 The I-66 Outside the Beltway project crosses 5.1 miles of the Accotink Creek watershed, passing over the tributaries of Long Branch (north), Bear Branch, Hatmark Branch, Hunters Branch, and the headwaters of the northwestern watershed. Construction activity began in late 2017 and accelerated in summer 2018. Although we were unable to hold the asphalt at bay or even to have current stormwater controls applied to this project, let's all keep our eyes on it and hold VDOT and contractors to standards the citizens and environment of Virginia are entitled to expect. Scroll down to observations from the field along I-66. SEE ENVIRONMENTAL VIOLATIONS ON I-66? Contact Virginia Department of Environmental Quality, 703-583-3800 or 24-hour hotline: 800-468-8892 or ONLINE REPORT FORM. Call DEQ when you observe sediment flowing into storm drains/streams, failing sediment control devices, or inadequate sediment control measures. Years after completion of the 495 Express Lanes, we are strugglinng to correct erosion control and replanting shortcomings that did not meet minimum standards. We fully expect to face the same situation with the I-66 Express Lanes. Read the ongoing sad story of the 495 Express Lanes years after construction - habitat loss, erosion & sedimentation, indifference, and replanting failures. The consortium I-66 Express Mobility Partners, owned by Cintra (Spain) and Meridiam Infrastructure (France), has the 50-year concession to build and and operate the project. The construction contractor will be FAM Construction, owned by Ferrovial Agroman (Spain - parent company of Cintra) and Allan Myers (Pennsylvania). January 27, 2019 - Field Survey: Conducted field survey of Chain Bridge Road interchange. The most serious erosion and sediment control failures observed December 16, 2018, have all been corrected, although some smaller issues persist. One troubling finding was a conveyance channel inadvertently filled in. No additional clearing has occured within the cloverleaf. A lone hawk circled forlornly overhead today, perhaps remembering its hunting grounds of last winter, now become a desolate wasteland. January 27, 2019 - Field Survey: Conducted field survey of Jermantown Road crossing. Not a single tree or shrub has been spared along this section. At least the erosion and sediment controls seems to be holding up. January 6, 2019 - Spotted elsewhere along the I-66 Project. Tree save area? One single solitary tree spared the bulldozer - not for conservation or preservation - but only because it stood next to the inviolable steel tree of a cell tower. If the cell tower could be spared, why not at least some of the woods around it? Is it just unfortunate force of habit that mandates clearing everything as a matter of course? Could it not just as easily be the standard practice to preserve everything not in the direct path of construction? December 16, 2018 - Field Survey: Conducted field survey of Chain Bridge Road interchange. In the previous 24 hours, 2.5 inches of rain fell, providing a stress test for sediment and erosion controls. Unfortunately, a number of failures were observed, including several breached silt fences and areas of bare soil left exposed to erosion. Representatives of Friends of Accotink Creek met with representatives of VDOT and the construction company, FAM. Senator Dave Marsden was also there and Delegate Kaye Kory attended by conference call. We explained the Friends of Accotink Creek concerns with sediment controls and habitat loss, especially the clearance of nearly all vegetative cover down to the banks of the tributary in the 123 cloverleaf. We also reminded VDOT the wetland at Willow Crescent Drive needs to be preserved. We will meet in April to review and inspect the project. December 6, 2018 - Field Survey: Conducted field survey of Nutley Street interchange. Little has changed at this interchange since our last inspection July 24, 2018. Recent mowing (of areas that have always been mowed) took place with large equipment when the ground was wet, leaving large swathes looking raw, rutted, and torn up. There is a previously unnoticed road of sorts into a wooded part of the SE quadrant that has also been left rutted and torn up by recent tractor movement over wet ground. We understand part of the reason for lack of activity here is due to reevaluation of the design of the future interchange. November 18, 2018 - Field Survey: Conducted field survey of streams in Chain Bridge Road interchange. Most of banks of the two branches of the Mosby Woods tributary that flow through the cloverleaf now have been cleared nearly to the banks or all the way to the banks. This level of clearing seems excessive and gratuitous and has been done in spite of the tidy little signs put in place to mark protected wetlands. Closer examination is disappointing, with many areas where erosion and sediment controls along the banks seem inadequate or even haphazard. Fish populations are still present in these tributaries, but the abundance seen before construction was not observed during this inspection. The loss of the shade and food source provided by streamside trees will surely harm fish populations. Our requests to speak with VDOT or FAM Construction staff regarding stream protection here have still not been fulfilled. November 9, 2018 - Field Survey: Conducted field survey of Chain Bridge Road interchange. Clearing of wooded areas within the cloverleaf has advanced since our September 7, 2018, survey. Parts of the two branches of the Mosby Woods tributary that flow through the cloverleaf now have been cleared nearly to the banks. This does not portend well for the future of the fish populations in these tributaries, which were surprisingly abundant, even within the cloverleaf, before construction. Our requests to speak with VDOT or FAM Construction staff regarding stream protection here have still not been fulfilled. Erosion and sediment controls in general continue to be adequate and holding up. Some of the areas most recently cleared, however, were looking quite raw and neglected. We may hope this will be quickly remedied. September 7, 2018 - Field Survey: Conducted field survey of Chain Bridge Road interchange. Most of the interior of the Chain Bridge Road cloverleaf was formerly thickly wooded, but this has changed dramatically since our June 18, 2018, survey. Much of the cloverleaf is now denuded, although wooded areas do remain. We may hope that the wooded areas have been set aside as protection for the two branches of the Mosby Woods tributary that flow through the cloverleaf. Our requests to speak with VDOT or FAM Construction staff regarding stream protection here have gone unanswered for weeks. Erosion and sediment controls seem so far to be adequate and holding up in spite of frequent rainstorms. The rain has had the benefit of promoting germination of stabilizing grasses. We were encouraged to see at least one sign warning against wetland disturbance - and hope there are many more we have not yet observed. September 6, 2018 - Field Survey: Conducted field surveys of two points that afford public access for observations of I-66. There is not much activity to observe at these points. Observation is possible only outside the soundwall. It may be that these spots will be unaffected by construction. The headwaters of the Mosby Woods tributary pass under Rosehaven Street and enter the Chain Bridge Road cloverleaf here. The number of mature vines inhabiting the soundwalls here is notable, including natives such as wild grape, Trumpet Vine, Virginia Creeper, and Poison Ivy,as well as alien invasives such as Porcelainberry and English Ivy. August 30, 2018 - Field Survey: Conducted field surveys of two points that afford public access for observations of I-66. Serious construction has not reached these points yet, other than some initial clearing for later equipment access. No erosion and sediment control issues were evident. Three tributary streams pass beneath I-66 in these areas, so they will be areas especially vulnerable to damage during construction. August 16, 2018 - Field Survey: Conducted field surveys of three points that afford public access for observations of I-66. Little has changed at these points since the initial clearing of acess paths. Nothing unexpected or noteworthy was observed as far as erosion and sediment controls. July 23, 24, & 27, 2018 - Field Survey: Conducted field surveys of several points that afford public access for observations of I-66. Tree clearing is well underway at the Jermantown Road overpass and western end of I-66 in the Accotink Creek watershed. Farther east, less clearing is visible. Although there were heavy rains the previous few days, no egregious erosion and sediment control failures were evident, although there were some problems at the Saintsbury Drive location. One discovery was a small wetland adjacent to Willow Cresent Drive. Although it is untouched so far, it has no protective signage. We may hope it has been recognized and will be avoided. June 18, 2018 - Field Survay: Conducted field survey of Chain Bridge Road interchange. Most of the interior of the Chain Bridge Road cloverleaf is thickly wooded, although heavily infested by invasive alien species. One area in the northeast of the cloverleaf has long been used as an equipment staging area. Tree clearing has begun, particularly in the northeast quadrant. portent for the future of these unfortunate tributaries. The survey results are posted online (Items 1, 3, 4, 5, & 24 HERE). Members of Friends of Accotink Creek made a quick survey of wooded habitat along the I-66 right-of-way likely to be reduced or lost in any widening. As might be expected, the quality of habitat was largely disappointing, with large numbers of invasive alien plants occupying only a narrow wooded buffer. Larger patches of better quality habitat are in the cloverleafs at Nutley street and Chain Bridge Road, in Southside Park in Vienna, and in the common property of the Four Winds community in Oakton. Degraded as it may be, even such small habitat areas have value that should be preserved. Also found during the survey was evidence of erosion and sediment control failures that we may expect on a large scale from any project that goes forward along I-66. Friends of Accotink Creek documented many such failures during construction of the 495 Express Lanes. This time what we found was small, but flagrant - bare slopes left to erode, silt fences collapsed, and quantities of sediment in waterways. Our Reports to VDOT and DEQ seem to have gone the way such reports are usually handled. Typically in these cases, if any action is taken, the responsible party is merely told to begin doing what they should have done all along - no fine is levied and no remediation of damage is required.